In a very exciting match Mohill emerged deserving winners by 1-14 to 2-7. This now puts us in a must win situation against St. Marys on Saturday evening in Pairc Sean.Mohill started off strongly leading by 1-2 to 0-0 after 8 minutes. The Mohill goal coming from county star Philly McGuinness.Ray Cox opened Annaduff’s account with a pointed free after 10 minutes. Kenny Bosquette added a second two minutes later. Ray Cox pointed two frees in the 20th and 22ndminutes followed by two superb points from Kenny Bosquette to leave the sides level after 28 minutes. Mohill got the next two points before on the stroke of half time Joe Cox brilliantly flicked a cross to the Mohill net to give Annaduff a one point lead at the break. Three minutes after the resumption Ray Cox pointed a free to give his side a two point lead. Mohill took control of the game for the next fifteen minutes scoring five points in succession to leave them leading by 1-10 to 1-7 after 50 minutes. Then the very skillful Kenny Bosquette slotted the ball to the Mohill net to leave the sides level with nine minutes remaining however that was Annaduff’s last score of the match with Mohill getting the last four points. Although Mohill deserved their win Annaduff will draw comfort from a reasonable performance . They hit twelve wides over the hour while Mohill were much more accurate in their shooting. Annaduff :Kevin Ludlow, Matty Cox, John Faughnan, Nigel Cox, Conor McLoughlin, Dermot Reynolds, David Duignan, Brendan Guckian , Fergal Carroll,James Cox, David McHugh,Cathal Cox, Ray Cox ( 0-4,0-4 from frees), Joe Cox (1-0), Kenny Bosquette ( 0-3,). Subs : Chris Farrell ( for N.Cox),Alan Cox ( for D.McHugh),Padraic Carroll ( for J.Cox), Ronan McCormack ( for K. Bosquette), Sean McNabola ( for C. Cox). At the draw held in Taylors, there was no Jackpot winner. The numbers drawn were : 6,7,12 and 18. The €50 winner was Lisa Duignan, Gortinee. The €25 winners were Sean Cox, c/o T.P.Cox, Dromod, Christopher Taylor, Drumsna, Lauren Cox, Corduff and Vincent Dolan, Furnace. The next draw will be held on Sunday night next in the Brandywell, Dromod where the Jackpot will be €4,000. Deepest Sympathy is extended to our former player Garda Michael Glancy, Ck-on-Shannon on the death of his mother Mrs. Mary Glancy, Carney, Co. Sligo . May she rest in peace. Congrats to the Under 14’s who reached the final by beating Glencar/Manor on Friday evening. Annaduff were beaten 2-9 to 1-9 by the county champions Glencar/Manor in the Park on Thursday evening. The match was played at championship pace throughout with very little separating the two sides. Both sides got fortunate fist half goals the Annaduff goal came after 3 minutes when the Manor ‘keeper Shane Sweeney misjudged the ball leaving Joe Cox with a simple tap in. Manor goal came on 15 minutes when a high lob from Alan Sweeney ended up in the Annaduff net. The sides were level 1-3 each at the break. Brendan Guckian got Annaduff off to a good start to the second half with a point however two minutes later Fintan McGourty got Glencar/ Manor’s second goal. James Glancy added another point to leave the visitors three point ahead. Annaduff then had their best spell of the match scoring four points in succession from Kenny Bosquette, Joe Cox, Ray Cox and Brendan Guckian.James Glancy and Joe Cox exchanged points before Manor full back the very impressive Adrian O’Flynn got his second point of the match after 55 minutes to put the sides level. James Glancy finished the match with the last three points including two superb frees ( what a pity he had an off day against Longford). On this performance both teams would need to show significant improvement if they are to figure in the later stages of the Championship. Annaduff :Kevin Ludlow, Matty Cox, John Faughnan, Nigel Cox, David Duignan, Dermot Reynolds, David McHugh, Brendan Guckian ( 0-2), Fergal Carroll, Ronan McCormack, Ray Cox ( 0-1),James Cox, Joe Cox (1-3), Kenny Bosquette ( 0-3,)( 0-1 “45”,0-1 free), Alan Cox. Subs used : Conor McLoughlin, Cathal Cox and Michael Rowley. 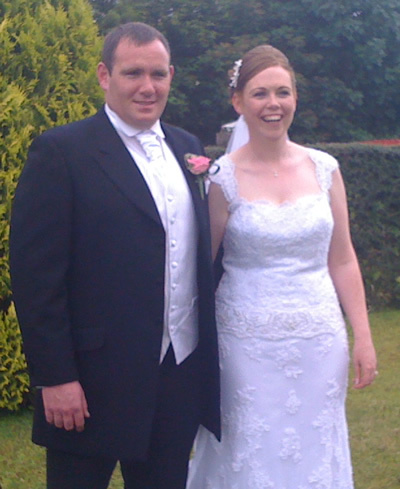 Congratulations to our Cathaoirleach Dan Reilly who got married to Anne Marie Byrnes in County Galway at the weekend. wine was produced for the big day. Also Congratulations to Pauric Carroll and Maresa Lannon who got married on Friday week. Allen Gaels beat us in our second Division 1 match of the week by 1-8 to 0-7 in Drumshanbo on Sunday. The Gaels had the advantage of a strong wind in the first half and led by 1-5 to 0-4 at the break . Their goal came after 29 minutes a rather fortunate fisted effort from Brian Mulvey. Annaduffs first half scores came from Ray Cox with three points and Kenny Bosquette. Annaduff played better against the wind than with it and their second half performance was poor. Ray Cox got two more points in the second period with David McHugh and Kenny Bosquette scored a point each. Allen Gaels were the more committed team and deserved their four point winning margin. Annaduff : Kevin Ludlow, Matty Cox, John Faughnan, Nigel Cox, James Cox, David Duignan, Conor McLoughlin, Fergal Carroll, Dermot Reynolds, David McHugh ( 0-1), Kenny Bosquette ( 0-2,0-1from free), Alan Cox, Gerard Reynolds, Cathal Cox, Ray Cox ( 0-5,0-3 from frees).Subs : Gene Cox ( for G. Reynolds) and Colm Cox ( for G. Cox). Annaduff playDromahair in Dromahair on this Wednesday15th July in the 13-a-side minor championship at 7pm. Please support. Annaduff play Glencar/Manor in the Park in Division 1on Thursday 16th at 7pm. Congratulations to Brendan Lynch and Clare Towning who got married in St.Mary’s Church, Annaduff on Friday last. At the draw held in Duignan’s of Drumsna, there was no Jackpot winner. The numbers drawn were :11,13,18 and 20.The €50 winner was Bridgie Dolan, Furnace. The €25 winners were Nathan Cox, Antfield, Fr. George Balfe, Rooskey, Carmel Rinn, Drumsna and Ursula Gaffney, Drumsna. The next draw will be held on Sunday night next in Taylor’s of Drumsna with a Jackpot of €3,900. Annaduff play Dromahair in under 14 championship in Dromahair at 7pm on this friday 17th. Annaduff Ladies play Ballinaglera in the Ladies “B” Quarter Final on Sunday next 19th July. Check Observer for venue and time. We wish a happy retirement to Liam Faughnan who is living a life of leisure after retiring as Principal of Moyne Commumity School. Annaduff play Carrigallen in the 13-a-side minor championship at 7pm on this Wednesday July 8th in Carrigallen. Please support. St. Mary’s ran out easy winners by 4-6 to 1-5 in the Park on Sunday. Mary’s led at half time by 1-5 to 1-1. Annaduffs goal came from Niall Maxwell after 23 minutes with Seamus Mulvihill getting a point a minute later. Our four second half points came from a “45” by Niall Hanrahan, a point from Cathal Cox and two points from Niall Maxwell. Best for Annaduff were Nigel Cox, Noel Ward, Micheal O’Dowd, Niall Hanrahan and Niall Maxwell. Annaduff : Niall O’Dowd,Fergus Beirne, Dan Reilly, Nigel Cox, Noel Ward ( Capt),Thomas Flanagan, Ronan Cox, Micheal O’Dowd, Niall Hanrahan ( 0-1),Niall Maxwell (1-2),Paddy Garvey, Padraig Dunne, Seamus Mulvihill ( 0-1),Cathal Cox(0-1), Timmy Cox. Deepest Sympathy is extended to Maura and Michael John Faughnan and family on the death of Maura’s niece Noreen Fitzpatrick and to the Reilly family, Bornacoola on the death of Marion Reilly. May they rest in Peace. Congratulations and well done to all the Annaduff pupils who took part in our on-line schools quiz. A big thank you to Master Tighe and the teachers who helped publicise the quiz and facilitated the prize draw. Annaduff play Dromahair in the 13-a-side minor championship at 7pm on this Wednesday July 1st. Please support. Best Wishes to Ray, Brendan and the team on Saturday and hopefully a victory. At the draw held in Cox’s Steakhouse Bar, there was no Jackpot winner. The numbers drawn were 5,13,20 and 21. The € 50 winner was Aobhlinn Maxwell, Derrywillow. The € 25 winners were Caitlin Dockery, Finnelaughta, Ray McHugh, Drumcree, Josephine Rowley, Drumcree and Nadine Dolan, Furnace. The next draw will take place on Sunday night next in Duignan’s with a Jackpot of € 3,800. Melvin Gaels beat us by 0-11 to 1-04 in the Shield in Kinlough on Friday. This game completes our Shield campaign. In the Shield on Friday evening we beat Drumreilly by 2-13 to 2-03. The ten point winning margin sums up the match as Annaduff playing well were always in control. Both sides lined out without their county panelists Annaduff minus Ray Cox and Brendan Guckian while Drumreilly were without Declan Maxwell, John McKeon and James Holohan. Annaduff led by 1-06 to 0-00 after twenty minutes their goal coming from Cathal Cox. Drumreilly got a goal after 29 minutes to leave Annaduff leading at half time by 1-08 to 1-01.Annaduff finished the match off as a contest with a Kenny Bosquette goal after 45 minutes.There were some great scores from Annaduff especially a superb point from substitute Sean McNabola when he came in from the wing soloing with his left foot and then kicking the ball over the bar with his right foot. Annaduff :Kevin Ludlow, Chris Farrell, John Faughnan, Nigel Cox, Matty Cox, Dermot Reynolds ,David Duignan ( 0-01), Alan Cox (0-01),Fergal Carroll ( 0-01),James Cox, Kenny Bosquette ( 1-04, 0-01 from frees), Ml. Faughnan, Colm Cox ( 0-01), Aaron O’Connor ( 0-02),Cathal Cox ( 1-01). Subs used:Sean McNabola ( 0-02, 0-01 from frees), Ronan McCormack , Thomas Flanagan, Fergus Beirne and Peadar Beirne. Deepest Sympathy is extended to the Mary and Patsy Gilhooly, Drumcree on the death of Marys mother Kate Flanagan, Ck-on-Shannon.May she rest in Peace. St. Caillins beat us in Division 3 on Saturday in Annaduff by 1-11 to 1-04. This defeat relegates us to Division 4 for next season. In Division 1 on Sunday in Carrick we lost to St. Marys by 0-09 to 0-06 in a very poor game. Gerard Reynolds who had a good game started off the scoring with a point for Annaduff after 2 minutes. Dermot Reynolds for Marys and Kenny Bosquette exchanged points. Marys got four points in succession before half time from Nicholas McWeeney, Ray Mulvey and two Gene Bohan frees to leave the score at the break Marys 0-05 to Annaduffs 0-02.Substitute Ml. Faughnan got Annaduff off to a good start in the second half with a point 41 minutes. Ray Mulvey put Carrick three points ahead with a point on 44 minutes. Kenny Bosquette and O’Donnell exchanged points before Dermot Reynolds of Annaduff brought Annaduff to be two points down with a good point on 51 minutes. Gene Bohan and Ray Mulvey sealed victory for Carrick with the next two points with Kenny Bosquette getting a consolation point for the visitors in the last minute of normal time. Annaduff: Barry Daly, Chris Farrell, Gene Cox, Nigel Cox, James Cox, Fergal Carroll, Matty Cox, Dermot Reynolds (0-01), Brendan Guckian, Alan Cox, Kenny Bosquette ( 0-03),Aaron O’Connor, Cathal Cox, David Duignan, Gerard Reynolds ( 0-01). Subs: Conor McLoughlin, (for Gene Cox), John Faughnan (for A. O’Connor), Michael Faughnan (0-01) (for C.McLoughlin) and Colm Cox (for A.Cox). At the draw held in McLoughlins, there was no Jackpot winner. The numbers drawn were 2,7,20 and 22. The €50 winner was Alan Cox, Antfield. The €25 winners were Maureen Dolan, Antfield, Ciaran Lyons, Dromod, Caitlin Dockery, Finnelaughta and Eimear Quigley, Drumsna.The next draw will be held on Sunday night next in Cox’s Steakhouse Bar, Dromod with a Jackpot of €3,700. Deepest Sympathy is extended to the Faughnan family on the death of Bill Faughnan and to the McGhee and Shanley families on the death of Richard McGhee. In Division 1 on Sunday in Annaduff we beat Mohill by by 3-06 to 0-12 in a thriller in Annaduff. This match had everything and was a great advertisement fo Leitrim Football. Colm Beirne opened the scoring with a Mohill point. Annaduff replied with six points in a row from Ray Cox, Ml. Rowley, Joe Cox, Padraig Carroll and two from sub. Cathal Cox to leave them leading after 21 minutes by 0-06 to 0-01.Mohill then cane more into the game and scored three points before half time two frees from Colm Beirne and a Ronan Kennedy point to leave Annaduff leading by two points at the break 0-06 to 0-04.After 33 minutes the impressive Seamus Kennedy got a Mohill point , it was 5 minutes before the next score and it was a well taken goal for Annaduff by Padraig Carroll after good work in the build up by Brendan Guckian and Cathal Cox.Colm Beirne replied with a pointed free for Mohill. Referee Frank Niblock awarded Annaduff a penaly after 41 minutes with Ml. Rowley calmly slotting the spot kick home. Padraig Carroll then collected the resultant kick out, he spotted Mohill keeper Mickey Lynch off his line and Carroll lobbed the keeper with a superb kick. This left the home side leading by 3-06 to 0-06 with seventeen minutes left. This was Annaduff’s last score and Mohill finished with six points in succession from Seamus Kennedy, Philly McGuinness and four from Colm Beirne. This was a dress rehearsal for the Championship and both sides will take encouragement from the game , it was Annaduff’s best performance all season while apart from conceding three goals Mohill were impressive Annaduff :Kevin Ludlow, Matty Cox, John Faughnan, Chris Farrell, David Duignan, Dermot Reynolds, David McHugh, Brendan Guckian, Alan Cox, Ray Cox ( 0-01), Fergal Carroll, James Cox, Ml. Rowley ( 1-1, 1-0 penalty),Padraic Carroll ( 2-01), Joe Cox (0-01). Subs: Cathal Cox ( 0-02), ( for Joe Cox), Kenny Bosquette ( for D. McHugh), Gerard Reynolds ( for M.Rowley) and Gene Cox ( for M.Cox). Mohill : Mickey Lynch, Ciaran Kennedy, Michael McGuinness, Niall McGovern, Daniel Beck, Darren McLoughlin, Seamus Kennedy (0-02), Philip McGuinness (0-01),Shane Canning, Paul Early, Ronan Gallagher, Colm Beirne ( 0-08), Ronan Kennedy ( 0-01), Paul McLoughlin, John McGuinness. Subs : Chris Higgins ( for P.McLoughlin) and Gavin Kelly ( for P.Early). In Division 2 on Saturday despite an excellent performance we were beaten by Aughnasheelin by a point . Aughnaseelin got a soft goal while Kenny Bosquette had a chance of of an equaliser near the end but his free just went wide. Congratulations to Martin and Michelle Faughnan, Riverstown and Annaduff on the birth of a baby boy. To celebrate the re launch of the official Annaduff GFC website we are giving you a chance to win some cool Annaduff GFC prizes. To be in with a chance of winning, simply answer the 20 questions in the Schools Quiz correctly. Best Wishes to Ray and the team on Sunday and hopefully a victory. Congratulations to Sean O’Heslin’s on the opening of their wonderful new facilities over the weekend. The minors were beaten in the 13 a side League by Allen Gaels by 6-12 to 3-06. 1st Prize: Atty Hynes, Brian Oates, Jim McLoughlin & Mick Moran with 93pts. 2nd Prize: Trevor Browne, John O’Connor, Andy Galvin & Chris Faughan with 92pts. 3rd Prize: John Talbot, Siobhan Talbot, Michael Gallagher & Andy McGaurn with 86pts. 4th Prize: Molly Daly, Ann Dolan, Brenda Keogh & Mary O’Rourke with 85pts. 5th Prize: Michael Solon, Harry O’Flynn, Joe & Don Reynolds with 84pts. 6th Prize: Tim & Frank Shanley, Alan Leech & Joe McElhone with 84pts. Sean White Car Sales / Athlone Renault, Cox’s Steakhouse, Percy French Hotel, Cllr Sinead Guckian, Athlone GAA, Dromod Homemade Boxty Ltd., Clara Motors, Cox’s Dry Cleaner & Laundry, Paddy’s Bar Carrick on Shannon, Cox Motor Repairs, Centra Foodstore Carrick on Shannon, Mick Cryan Mullingar, Allen Gaels GAA, Gortletteragh GAA, Cloone GAA, Kilglass Gaels GAA, T&B Auto-Factors, Taylor’s Bar Drumsna, Francis Cox & Sons Stonemason’s, Crowe’s Garage Dromod, Robeplan, Carrick on Shannon Golf Club, Vibrotone Health & Fitness, John Russell Physical & Sports Injury Therapist, Conor Gray & Associates, Frank McGuire Rooskey, Frank Feighan TD, Neil Lyons Crash Repair, Athlone Auto-Factors, Newline Garage Elphin, Sean Devine, BEAM Vacuum system, Athlone Nissan, Classic Wrought Iron Ltd, The Brandywell Bar, Vincent Reynolds Taxi service, Bornacoola GFC, Cllr Sean McGowan, Kalzen Tool Hire, Drumcree Joinery Ltd, Quinn Group, Opel Central Motors Mohill, Terry McGuinness, Mary O’Connor, Michael O’Dowd, ThermoKing – Donal Cox, Leitrim Crystal, B&D Walsh Auctioneers, Tom Reilly Bros. Builders, Carrick Auto-Factors, McWeeneys Bus Hire, Ballyfeeney Rock, Aidan Hackett Bornacoola, Maurice & Eamon Shanley, Stenson Hardware, Cllr Enda Stenson, Baxters Centra Mohill, Annaduff Ladies GAA, JHP Architectural Consultants & Planning Agents, The Tile Store Longford, Frank Reynolds Plant Hire, Gills Tyres & Garage, James Faughnan & Claire Moran – Cathal L Flynn Solicitors, Ken McManus Bus Hire, PC Construction Services, Drino Drinks Ltd.
At the draw held in Taylor’s, there was no Jackpot winner. The numbers drawn were : 4,6,15 and 20. The € 50 winner was Dorothy Thornton, Derrycarne. The €25 winners were Dorothy O’Connor, Kilyfad, Eugene Cox, Antfield, Sean Quigley, Drumsna and Eugene Cox, Antfield. The next draw will be held on Sunday night next in the Brandywell with a Jackpot of €3,500. In the Irish Independent preview of the Connacht Championship on Tuesday Ray Cox got a special mention in the “Who could make a name for Himself”. Best Wishes are extended to Terry McGuinness who is recovering after a back operation. Congratulations to star midfielder Fergal Carroll who got married on Saturday week to Triona Walsh, Cratloe, Co. Clare. We wish Feargal and Triona many years of happiness. his father Francie Gilmartin. May he rest in Peace. In Division 1 we are in sixth position with 6 points from 5 matches. We have six matches to play Mohill, Glencar/Manor and Drumreilly at home and St. Marys, Allen Gaels and Ballinamore away. In Division 2 we are ninth with 2 points from 5 matches while we are pointless in Division 3.